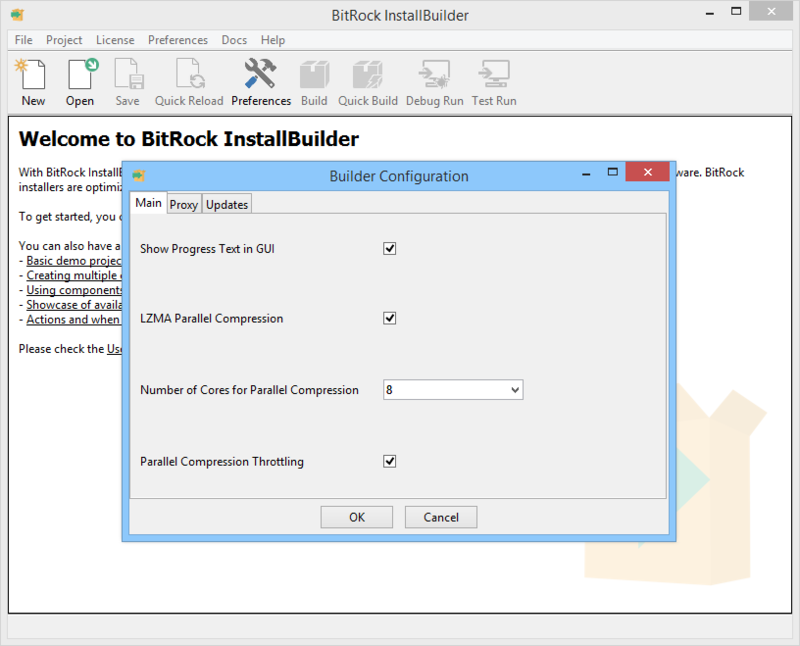 InstallBuilder supports two build modes, "build" and "quickbuild", which are explained in the following sections. Load and validate the XML project. If the GUI builder is being used, the project has already been loaded and validated. A regular build always creates a new installer and repacks all of the files. On the contrary, using Quick Build makes it possible to do incremental builds in which only new files or files that have changed will be repackaged. If you are packaging hundreds of megabytes, this should result in significantly quicker builds, but the resulting installers may increase in size with each new incremental build. It is recommended that you use quickbuild during the development process and do a full builds before the official release. On Windows, there are separate executables for the Graphical Builder Interface (builder.exe) and the Command Line Interface (builder-cli.exe). This is because Windows imposes a compilation-time switch to distinguish between command line applications and graphical applications, the latter lacking the ability to write to the console. bin/builder build /path/to/project.xml --setvars project.fullName="New Project Name"
where some_variable_name is a variable that will be available in the installer <preBuildActionList>. The preceding sections introduced the basic command line build process, specifying the project to build and the target platform. They also presented the --setvars flag, which allows some project elements to be modified. However, the build process allows much more significant customizations. This example assumes that you plan to build two different installers. A complete project, including documentation and some optional applications and a lightweight installer, that will only bundle the main project files. The obvious solution would be to have two projects: one that bundles all of the components and the other with the primary project files. This can be achieved by organizing the files and logic into components and using the <include> directive, which will allow you to separate them into multiple .xml files. All the above functionality would work if you defined buildFlavor as a regular variable instead of creating a hidden parameter, but you would not be able to access it at runtime in that case. InstallBuilder provides three compression types that can be set in the project properties. Different algorithm may be used depending on requirements. The ZIP compression is recommended for installers that deliver small installers or consists of files that cannot be effectively compressed - such as consisting mainly of media files. LZMA Ultra is recommended for installers that deliver payload that can be compressed - such as binary files or other file formats that are not compressed. In terms of memory usage, ZIP requires the least memory when building the installers as well as at runtime. LZMA algorithm has slightly higher memory requirements when installing and larger memory requirements when building. LZMA Ultra compression requires more memory than either ZIP or LZMA algorithms - both when building the installers and when installer is unpacking the files. Memory that is used by LZMA Ultra can be configured by setting the <lzmaUltraBlockSize> option. This option specifies the maximum size of a block in megabytes that will be used to compress files. The value affects memory requirements both for build time as well as installation time. The default value is 80, which means a block up to 80MB will be used. The recommended value range is between 40 and 100. Setting this value to a lower value will decrease the memory requirements, but at the same time make the installer slightly larger. Setting this value to a higher value will increase memory requirements, but may decrease installer size. Setting <lzmaUltraBlockSize> to high values such as 120 may cause the 32-bit versions of the builder to run out of memory. If the project has to be built with <lzmaUltraBlockSize> set to a high value, it is recommended to use the InstallBuilder on Linux 64-bit platform as it can use more than 4GB of process memory. InstallBuilder supports using multiple cores and/or threads for building installers. This is supported for projects that use LZMA and LZMA Ultra compression algorithms and when the payload encryption is disabled. This functionality is enabled by default and uses all of the logical CPUs that the machine has. For example a machine with 4 cores that have 2 threads each will try to use all 8 logical processors. When using the command line tool the compression can be customized using options described in more details below. The settings are applied to current build only. When using the GUI building tool, the settings for parallel compression can be found by opening the Preferences window. The settings from the preferences window are stored in user settings and used by all builds made from the GUI. The LZMA Parallel Compression option allows disabling this functionality entirely. When the option is disabled, InstallBuilder will only use single core when performing the compression. The Number of Cores for Parallel Compression option allows specifying number of logical processors that will be used for the build process. The value Auto indicates using all available logical processors and is the default value. Setting it to any other value will cause InstallBuilder to use that amount of logical processors for the compression, regardless of machine’s current processor count. The Parallel Compression Throttling option enabled or disabled running the compression processes at lower priority. When enabled, this option prevents InstallBuilder from using all of machine’s resources which may degrade performance of other applications or processes running on the machine. It is recommended to leave this option enabled. InstallBuilder supports using multiple cores and/or threads when installing files on the target machine. This is supported for installers that are built using the LZMA and LZMA Ultra compression algorithms and when the payload encryption is disabled. This functionality is enabled by default and by default InstallBuilder uses all of the logical processors that the machine has. The limit for maximum number of cores to use is 8. This is because using more cores will not decrease the installation time, but the process will use more memory. It is possible to customize it using the <parallelDecompressionCores> project property, which will specify the maximum number of cores to use during uncompression. This option is mainly useful when installer will often be run on machines with large number of processors, but very little memory being available and it is not recommended to change the default value. Regardless of the value for <parallelDecompressionCores>, the installer will use either the number of logical processors available on the target machine if it is lower than <parallelDecompressionCores>. Setting the value to 1 will completely disable the parallel decompression functionality.